North County Soccer Park’s Lil’ Kickers is a non-competitive, instructional soccer program created to introduce children ages 18 months to 9 years old to the beautiful game of soccer. Lil’ Kickers classes develop important soccer skills such as dribbling, trapping, and shooting. Passing skills are also learned at the older ages. Developmentally appropriate equipment and games are used to teach your child the fundamentals of soccer in a fun, exciting, and positive environment. Twelve (12) classes per session (one class per week). Lil’ Kickers T-shirt and Lil’ Kickers Award Medal included. All classes are held at the NCSP Poway and Escondido Sports Center. The Bunnies class is designed for toddlers and parents to explore basic soccer and movement activities to develop gross motor skills and to teach the fundamental skill of kicking the ball using feet. Social skill building is a key element of the Bunnies class, where children learn to play with others and start interacting with their soccer coach in addition to their parent. Activities include Score-a-Goal! game, Squishy Balls, parachute activities, and the famous Cone Towers! Class is 50 minutes, once a week, child to coach ratio of 15:1. Thumpers is a parent/child class that introduces 2-year-old children to the basic concepts of soccer, including dribbling the soccer ball using feet (not hands! ), trapping, and shooting. Parents help guide children through the activities as they begin to learn to listen to the Lil’ Kickers Coach’s instructions and to interact with other children in the class. Class is 50 minutes, once a week, child to coach ratio is 12:1. Cottontails is a parent/child class, but it is designed to encourage your child to gain more independence and to start interacting more with the Lil’ Kickers coach rather than just interacting with you, the parent. Parents certainly are encouraged to help their child with the activities as needed. However, your child’s Cottontails Coach will enthusiastically engage your child in various soccer-related activities to promote more and more independent interaction between player and coach. Cottontails focus on dribbling the soccer ball using feet only (not hands! ), trapping, and shooting. During the activities, teamwork and interacting positively with the Lil’ Kickers Coach are emphasized. Class is 50 minutes, once a week, child to coach ratio is at least 7:1. 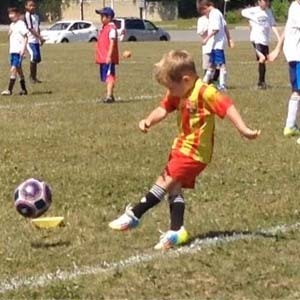 Big Feet classes provide a great introduction to the sport of soccer for your 5- or 6-year-old child. Big Feet players learn to dribble the ball close to their feet (no hands! ), to trap the ball for better ball control, and to shoot and score goals. All of this learning by your Big Feet player takes place in a non-competitive environment. This is a key requirement for children this age to learn to love the sport of soccer. Often times, 5- and 6-year-old children with no soccer experience or skills join soccer leagues where well-intentioned parents excitedly scream from the sidelines that the player is going the wrong way or doesn’t know what they’re doing. Children can shut down in this type of environment. Big Feet classes allow children to learn the fundamentals of soccer without the pressure of a competitive game. Although the focus in Big Feet is on individual soccer skills, Big Feet players also will learn teamwork and passing skills when they are introduced to scrimmages (or small-sided games) where two “teams” are going after one soccer ball. Class is 50 minutes, once a week, child to coach ratio of 12:1. Micro Classes for either 4- and 5-year-olds or 6- to 9-year-olds provide more advanced soccer skills training and weekly scrimmages for your soccer player. Micro League-ers continue to work on dribbling and ball control skills, but also work on shielding, “give and go’s”, and other team-related tactics and strategies. Each class includes 30 minutes of instruction to work on individual and team skills, and then 20 minutes of scrimmage to work on applying those skills in a “game” setting (i.e., 2 “teams” going after 1 ball). The Lil’ Kickers coaches periodically stop the scrimmage to instruct the players on how to improve their game skills and tactics. Shinguards are mandatory. Class is 50 minutes, once a week, 30 minutes instruction/20 minute scrimmage, child to coach ratio of at least 12:1. Take the next step with Skills Institute – a soccer development program. Our players have fun learning and improving technical and tactical soccer skills while tackling key developmental milestones.